Basically, Mom & Me is the flagship of Mahindra Retail Pvt Ltd. We are currently expanding its scope in major cities and towns in India. We have already opened 100 stores and many more are coming forward very soon. One such outlet is at Celebration Mall in Udaipur which provides newly mother all the stuffs for herself and her new born. Mom & Me is destined to be the choice of every mother and child. It provides them with world class products and services. We trust in serving mother and child in a personalized fashion with awe-inspiring love and care. Mom & Me aim at bringing love and a sense of well-being to every mother and child. Our main concern is to select products that are safe and of the highest quality. We try to bring excellence in all aspects of work, products and services. Mom & Me at Udaipur stores provide products for newly born, infant and mothers. From garments to creams and oils to feeding bottles to toys and what not, Mom & Me is a best place for any kind of stuff required for a mother and her child. 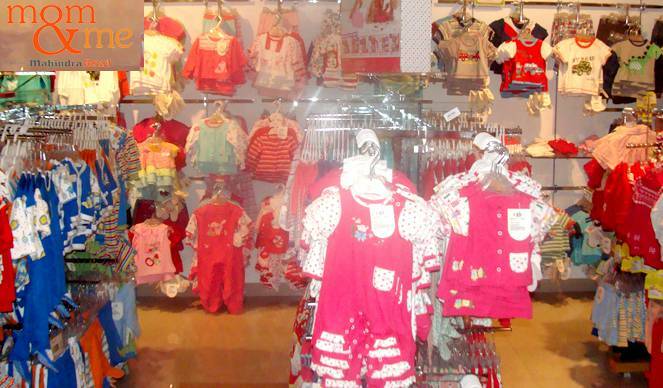 No second thoughts clicks your imagination when are to shop for your baby. We nourish customer relationships with care and empathy. We whole heartedly welcome you to shop in one of the best showroom for mom and her child; we are obliged to serve our best.